A graduate of the University of the Philippines College of Medicine, Dr. Balatbat completed his training at the Yale Primary Care Internal Medicine Residency Program in New Haven, CT and then completed a fellowship in Infectious Diseases at the UC Davis Medical Center. 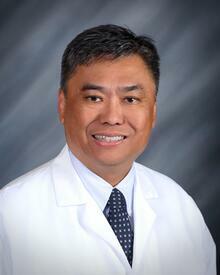 He is board certified in Internal Medicine and is a fellow of the American College of Physicians. Dr. Balatbat has been with Mercy Medical Group for 11 years and served as the chair of the Department of Internal Medicine for the past 9 years. As chair, he has championed primary care redesign and transformation, including the development of MMG’s patient centered medical home model. He has also led MMG’s population health and quality initiatives. During his 11 year tenure as an Internal Medicine provider at Mercy Medical Group, Dr. Balatbat was an ardent proponent for preventative care, playing an instrumental role in several national honors received by the group, including recognition for diabetes care and prevention from the American Medical Group Association and recognition for best practices aimed at reducing heart attack and stroke from the American Medical Association and the American Heart Association. Dr. Balatbat will continue to see patients at his Q Street clinic after taking on the CMO role. Mercy Medical Group, a service of Dignity Health Medical Foundation, is a multi-specialty clinic with patient service centers located throughout the greater Sacramento area. It includes more than 400 medical providers and 900 Dignity Health Medical Foundation employees providing services to thousands of patients in the Sacramento area and its affiliated local Dignity Health hospitals (Mercy General Hospital, Mercy San Juan Medical Center, Mercy Hospital of Folsom and Methodist Hospital of Sacramento). Dignity Health Medical Foundation has 29 patient care center locations in Sacramento. For more information on Dignity Health Medical Foundation d/b/a Mercy Medical Group and the wide range of services it provides, visit our website at mymercymedicalgroup.org.